The dynamic reversal indicator identifies oversold and overbought markets using a dynamic approach to adjust to recent market behavior. The indicator works by measuring the current price swing and comparing it to previous price swings to see how far prices have stretched in relation to recent market activity. Using this dynamic approach the indicator continually adjusts for market volatility and trend while identifying oversold and overbought markets. The indicator also measures bullish and bearish price swings independently from each other in an effort to provide more accurate analysis in trending markets. For example in a bullish uptrend bearish price swings (pullbacks) tend to be smaller than those of bullish price swings (continuations) in the same uptrend and so the dynamic reversal indicator analyses each type of pullback independently of the other. The chart below shows the dynamic reversal indicator applied to QCOM. Oversold markets with the possibility of rising shortly are shown with a yellow dot while overbought markets with the potential to fall over the next few bars have a red dot. The intraday chart below shows the dynamic reversal indicator applied to the forex markets. 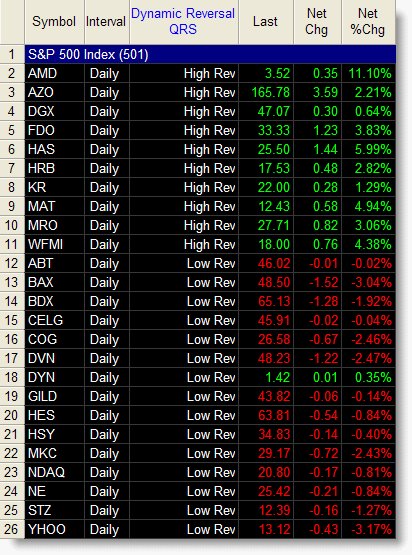 Click to view all dynamic reversal indicator screenshots. Our dynamic reversal indicators have been designed to be flexible and include multiple settings including the ability to adjust the sensitivity of the indicator. Identifying price swings in the market being traded is not restricted to just one type of price swing. You can detect price swings using any market price, not just the closing price. Due to the amount of information available when using the dynamic reversal indicator we have provided two dedicated RadarScreen indicators for you to use. The first is the 'full' version of the dynamic reversal indicator and when applied to a RadarScreen the full dynamic reversal RadarScreen indicator provides additional information beyond alerting you to potential market reversals. Reversal - displays a text message when a reversal alert condition is true. Up Bars – the number of bars in the current price swing if price is rising. 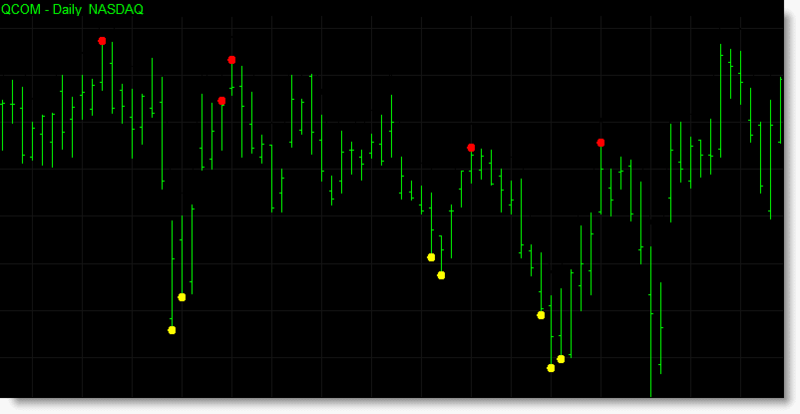 Dyn Up Bars – the dynamic value of the number of bars during bullish price swings. Dn Bars – the number of bars in the current price swing if price is falling. Dyn Dn Bars – the dynamic value of the number of bars during bearish price swings. Up Swing – the value of current bullish price swing if price is rising. 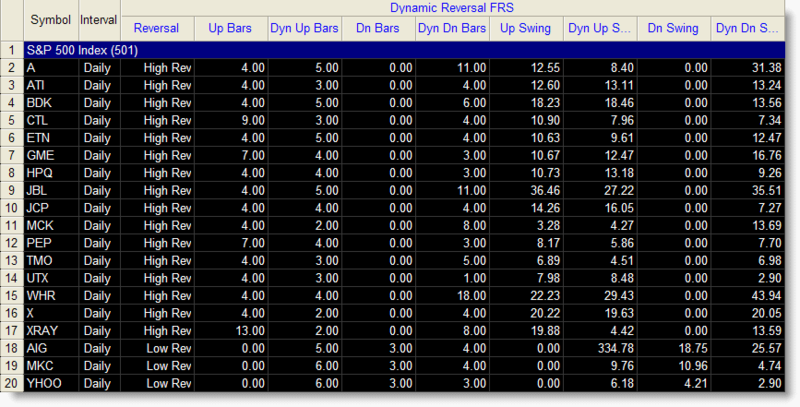 Dyn Up Swing – the dynamic price value of bullish price swings. Dn Swing – the value of current bearish price swing if price is falling. Dyn Dn Swing – the dynamic price value of bearish price swings. A TradeStation RadarScreen with the 'full' dynamic reversal indicator applied. The second is a 'quick' version of the dynamic reversal indicator which focuses solely on alerting you to reversal opportunities without the additional data. A TradeStation RadarScreen with the 'quick' dynamic reversal indicator applied. 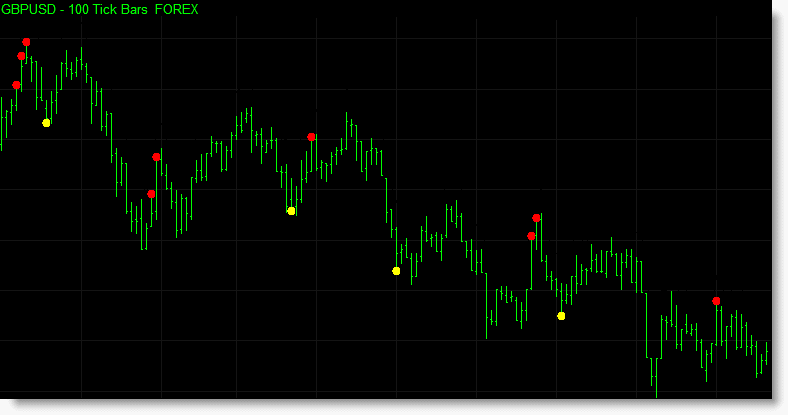 Click the button below to add the Dynamic Reversal Indicator for TradeStation to your wish list.